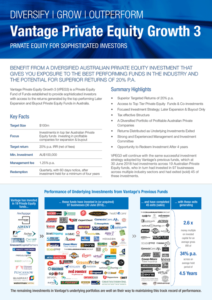 Vantage Private Equity Growth 3 (VPEG3) is a Private Equity Fund of Funds established to provide investors with access to the returns generated by the top performing Later Expansion and Buyout, Private Equity Funds in Australia. 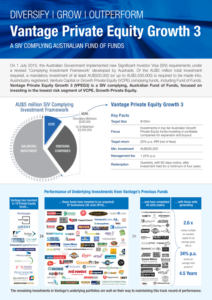 VPEG3 is also registered with Innovation Australia, as a complying investment for the Significant Investor Visa (SIV), focused on investing in the lowest risk segment of a SIV applicants mandatory VCPE investment, Growth Private Equity. Private Equity as an asset class has attracted a growing amount of interest from investors over recent years as it continues to outperform traditional asset classes. VPEG3 offers investors the opportunity to share in the strong returns of this asset class, while substantially removing the hurdles that have traditionally limited investor access to it. Through its unique structure, focussed investment strategy and guidelines, systematic and rigorous fund manager selection criteria and its arrangements with highly experienced Private Equity investment management and advisory groups, the Investment Manager is confident of VPEG3, developing a highly diversified portfolio of underlying, profitable, private company investments and ultimately delivering superior absolute returns to Investors. VPEG3 is structured as an Incorporated Limited Partnership (ILP L0000419E), Australian Fund of Funds (AFOF). This ‘flow through’ structure offers tax advantages to Investors in that all gains and income distributed by VPEG3 will be taxed in the hands of the Investor at their own tax rate. VPEG3’s structure enables Investors seeking to apply to the Australian government for a Subclass 188 Visa, (Significant Investor stream), to meet the mandated minimum $500,000 investment into the Venture Capital or Growth Private Equity Funds (VCPE) sector. Please visit Vantage Asset Management’s website to seek information on how to invest in VPEG4 now.